Home / In the Media / As Obama tries to shift the debate, will Democrats continue to endorse Israel’s colonization of the West Bank? As Obama tries to shift the debate, will Democrats continue to endorse Israel’s colonization of the West Bank? President Barack Obama has inherited a difficult challenge in pushing Israel to end the expansion of its illegal settlements in the occupied West Bank. With the right-wing Israeli government of Prime Minister Benjamin Netanyahu categorically rejecting the idea of a freeze and with Democratic-controlled Congress ruling out using the billions of dollars of U.S. military aid to Israel as leverage, the situation remains deadlocked. Along with many Israelis and other supporters of Israel, Obama recognizes that these settlements are one of the chief obstacles to Israeli-Palestinian peace. Given that Israel cannot be secure unless the Palestinians are also given the right to a state of their own and that a viable Palestinian state cannot be created as long as Israel continues colonizing Palestinian land on the West Bank, Obama sees a settlement freeze as critical. Unlike Iraq, Afghanistan and other foreign policy dilemmas facing the new administration, however, the Democrats cannot blame Obama’s challenges primarily on the legacy of George W. Bush. In the case of the Israeli settlements, much of the blame belongs to former President Bill Clinton and other Democrats who helped facilitate Israel’s dramatic expansion of its West Bank settlements in the 1990s. Although the 1967 Israeli invasion of the West Bank, then controlled by the Kingdom of Jordan, was initially justified to create a “buffer zone” to protect Israelis, it soon became apparent that the actual goal was to expand Israeli territory. Ariel Sharon, who prior to becoming prime minister served as the housing minister in earlier right-wing governments overseeing settlement expansion, bragged in 1995 that these settlements were “the only factor” that had prevented then-Prime Minister Yitzhak Rabin from agreeing to withdraw from the occupied territories entirely as part of the 1993 Oslo Agreement. Sharon, who has been praised as a peacemaker by House Speaker Nancy Pelosi, D-Calif., and other Democratic leaders, expressed his pride in the fact that this had “created difficulties” in the negotiations with the Palestinians. Indeed, had Israel’s Labor governments not had to worry about the domestic political consequences from such a withdrawal as a result of these illegal settlements, there would probably have been peace years ago. Now with right-wing parties dominating Israeli politics and nearly a half-million Israeli settlers on land that was to become a Palestinian state, it will be even more difficult. The Palestine Authority — including Palestinian President Mahmoud Abbas, his Fatah party, and the Palestine Liberation Organization — have already recognized exclusive Israeli control of 78 percent of Palestine, yet the Israelis have insisted on expanding their control over much of the remaining 22 percent through this colonization drive. While the Palestine Authority has administration over the majority of the West Bank’s Palestinian population, Israeli occupation forces still control much of the land in between these towns and cities, with hundreds of checkpoints severely restricting the movement of people and goods within the West Bank, in order to protect these settlements. Clashes between right-wing settler militias, often back by the Israeli army, and local Palestinians are common. These settlements and the swathes of territories connecting them to each other and to Israel divide the Palestinian-controlled territory into 43 noncontiguous cantons separated by Israeli checkpoints, thereby making the creation of a viable Palestinian state virtually impossible. Indeed, this appears to be the principle reason for Israel’s colonization drive and why so many U.S. officials have supported it. It is illegal under the Fourth Geneva Convention for any country to transfer its civilian population onto lands seized by military force. A landmark 2004 ruling by the World Court underscored the obligation of signatories such as the United States to make a good-faith effort to enforce such international legal obligations on countries with which they have influence, but Democratic congressional leaders joined President George W. Bush in denouncing the decision. Furthermore, under U.N. Security Council resolutions 446, 452, 465 and 471, Israel is explicitly required to withdraw from these settlements, but successive Democratic and Republican administrations — with support of congressional leaders of both parties — have blocked the United Nations from enforcing these resolutions. As part of an annex in the 1978 Camp David Agreement between Israel and Egypt, Israeli Prime Minister Menachem Begin promised a five-year settlement freeze. When the Israelis resumed construction after only three months, President Jimmy Carter refused to hold Begin to his promise, even though Carter acknowledged that these settlements were illegal and the United States was given the role of guarantor of the peace treaty. This was not the last time the Israeli government would promise to freeze settlements only to break that promise with the knowledge that the Democratic leadership in Washington would let them get away with it. In 1991, President George H.W. Bush insisted on a settlement freeze as a condition to granting a controversial $10 billion loan guarantee to Israel. In response, leading members of Congress — including the leading candidates for the 1992 Democratic presidential nomination — attacked Bush from the right by calling on the president to grant the loan guarantee unconditionally. These predominantly Democratic critics claimed that the loans were to be used for housing for Jewish immigrants from the former Soviet Union, despite the fact that none of the money in the loan agreement was actually earmarked for such purposes and Israel had thousands of unoccupied housing units then available, even in the city of Beersheva, where most of the recent immigrants were initially being settled. Indeed, the Israeli government acknowledged that the loans were more of a cushion than anything vital to the economy. Despite this, Democratic leaders like Sen. Tom Harkin, D-Iowa, insisted that Bush was “holding Soviet Jews hostage” and challenged the administration’s assessment that expanding Israeli settlements was an obstacle to peace. Under pressure from the Democrats — who then controlled both houses of Congress — as well as incipient Democratic presidential nominee Bill Clinton, Bush capitulated and approved the loan guarantee with Israel in July 2002, getting the Israelis to only limit new construction to the “natural growth” of existing settlements. By the following year, however, it became apparent that Israel, with the acquiescence of the new Clinton administration, interpreted this restriction so liberally that the number of new Israeli colonists in the occupied territories grew faster than ever. Indeed, this infusion of billions of dollars worth of U.S.-backed loans were critical in enabling Israel to embark on the dramatic expansion of Israeli settlements in the coming years. When the Oslo Accords were signed in September 1993, the Palestinians pressed to address the settlements issue immediately. The Clinton administration, however, insisted that such discussions be delayed. By putting off such a fundamental issue as the settlements as a “final status issue,” the United States gave the Israelis the ability to continue to create facts on the ground even as the peace process slowly moved forward. Clinton knew this would make a final peace agreement all the more difficult, yet at no point did the administration insist that Israel stop the expansion of Jewish settlements and confiscation of land that the Palestinians and others had assumed was destined to be part of a Palestinian state. 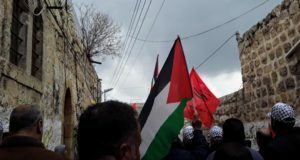 It is only because of these settlements that the boundaries for a future Palestinian state envisioned by Clinton and Israeli Prime Minister Ehud Barak in the July 2000 summit at Camp David took its unviable geographic dimensions, which forced Palestinian leader Yasser Arafat to reject it. Barak, with the support of Clinton, insisted on holding on to 69 Jewish settlements in the West Bank, where 85 percent of the settlers live. Furthermore, under Barak’s U.S.-backed plan, the West Bank would have been split up by a series of settlement blocs, bypass roads and Israeli roadblocks, in effect dividing the new Palestinian “state” into four noncontiguous cantons, requiring Palestinians and much of the country’s domestic commerce to go through Israeli checkpoints to go from one part of their state to another. In addition, according to this proposal, Israel would also control Palestinian water resources in order to give priority of that scarce resource to the settlements. There is little question that the failure of Camp David could have been avoided had Bill Clinton used his considerable leverage to halt the settlement expansion at the start of the peace process. Even top Clinton administration officials like Robert Malley have acknowledged that the United States had not been tough enough on Israel for its settlement drive, and this failure to do so was a major factor in the collapse of the peace process. Pelosi to this day insists that Barak had made “a generous and historic proposal,” and Howard Berman, D-Calif., chairman of the House Foreign Relations Committee, claimed during committee hearings that Arafat’s rejection of Barak’s proposal was indicative of the Palestinians’ determination “to destroy Israel.” In the view of congressional Democrats, then, if you refuse to accept the large-scale foreign colonization of your country, you are not interested in peace. Clinton did not just tolerate the expansion of settlements, he actually encouraged it. Under pressure from peace and human rights groups, Bush had attached a provision to the 1992 loan-guarantee agreement requiring the president to deduct the costs of additional settlement activity from the $2 billion annual installment of the loan. In October 1993, the U.S. officially announced to Israel that there would be a $437 million deduction in the next year’s loan guarantee due to settlement construction during the 1993 fiscal year. However, State Department Middle East peace talks coordinator Dennis Ross (whom Obama has appointed to a key State Department post addressing regional issues) immediately let the Israeli government know that the United States would find a way to restore the full funding. Within a month, Clinton authorized Israel to draw an additional $500 million in U.S. military supplies from NATO warehouses in Europe. A similar scenario unfolded the following year: After deducting $311.8 million spent on settlements from the1995 loans, Clinton authorized $95.8 for help in redeploying troops from the Gaza Strip and $240 million to facilitate withdrawal from West Bank cities, based on the rather dubious assertion that it costs more to withdraw troops than to maintain them in hostile urban areas. Clinton explicitly promised the Israelis that aid would remain constant regardless of Israeli settlement policies. What resulted, then, was that the United States began, in effect, subsidizing the settlements, since the Israelis knew that for every dollar that they contributed to maintaining and expanding their presence in the occupied territories, the United States would convert a loan guarantee into a grant. Over 100 settlements lie outside what most observers consider could realistically be annexed to Israel under a mutually acceptable peace plan. Between the Oslo II accord in September 1995 and the start of final-status talks in March 2000, successive Israeli governments were envisioning maintaining all but the most isolated of these settlements, which would restrict the territory of a Palestinian state into a series of noncontiguous cantons. Following Arafat’s rejection of that strategy and the subsequent outbreak of violence in Israel and the occupied territories that fall, Clinton and Barak largely abandoned this strategy by December, belatedly expressing an openness to reducing them to a much smaller number of settlement blocs. Israeli-Palestinian negotiations over the next few weeks came close to producing a final peace agreement, but with George W. Bush assuming office in the United States and Ariel Sharon become prime minister in Israel, they were suspended. Over the next eight years, the Israelis reverted back to the old strategy with no apparent objections from the Bush administration or congressional Democrats. A particular sore point for Palestinians over the settlements arose from the Oslo Accords, which refer to the West Bank and Gaza Strip as a “single territorial unit, the integrity and status of which will be preserved during the interim period.” This was essentially a prohibition against either side taking steps that could prejudice the permanent-status negotiations. As a result, the Palestinians — when they signed the agreement — assumed that this would prevent the Israelis from building more settlements. Furthermore, as the principal guarantor of the Oslo agreement, the United States was obliged to force Israel to cease its construction if they tried to do so. However, Israel and the United States have refused to live up to their obligations, and — since the signing of the Oslo Accords — the total number of settlers in the occupied territories has nearly doubled from approximately 250,000 to close to a half-million, moving onto land that the Palestinians assumed would be returned to the 3 million Palestinians that already live there and the large numbers of refugees who would presumably be resettling to the new Palestinian state. To the shock of much of the international community, the Clinton administration also insisted that the Fourth Geneva Convention and the four U.N. Security Council resolutions addressing the settlements issue were suddenly no longer relevant. In 1997, the United States vetoed a U.N. Security Council resolution sponsored by France, Portugal, Sweden and Great Britain calling on Israel to cease its settlement activities and come into compliance with the Fourth Geneva Convention. Shortly thereafter, the United States vetoed a second resolution calling on Israel to cease construction of an illegal settlement in an environmentally sensitive area near Bethlehem designed to complete the encirclement of Arab East Jerusalem. In reality, neither the Fourth Geneva Convention nor the U.N. Security Council resolutions can be superseded by a bilateral agreement, particularly when one of the two parties (in this case, the Palestinians) insist they are still relevant. Indeed, none of the other 14 members of the Security Council accepted the Clinton administration radical reinterpretation of international law in their support for Israel’s settlement policies. Furthermore, U.N. Secretary-General Kofi Annan — backed by a broad consensus of international legal scholars — repeatedly insisted that these Security Council resolutions were still valid. Given the gross asymmetry in power between the Palestinians under occupation and the Israeli occupiers — whose primary military, economic and diplomatic supporter was also the chief mediator in the negotiations — it was rather obvious that the U.S.-led peace process would be unable to stop settlement expansion. It appears, then, that the Clinton administration’s insistence on sidelining the United Nations was to enable Israel to do just that. It was during this period that the Israelis began building a massive highway system of 29 roads totaling nearly 300 miles, designed to perpetuate effective Israeli control of most of the West Bank. These highways — designed to connect the settlements with each other and with Israel proper — are creating a series of borders and barriers, in effect isolating Palestinian areas into islands. In addition, since Israel has defined these highways as “security roads,” they reach a width of 350 yards (50 yards of road plus 150 yards of “sanitized” margins on each side), the equivalent of 3 1/2 football fields. 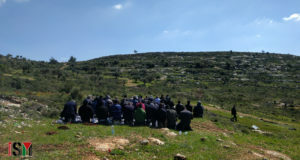 This has resulted in the destruction of some of the area’s richest farmland, including olive groves and vineyards that have been owned and farmed by Palestinian families for generations. The impact of such a massive road system in an area the size of Delaware is staggering, and has serious political, economic and environmental implications. As part of what Clinton referred to as “implementation funding” of the 1998 Wye River Agreement, in which Israel agreed to withdraw from an additional 14 percent of the West Bank, the United States offered $1.2 billion in supplementary foreign aid to the Israeli government. Most of the funding was reserved for armaments, but much of the nonmilitary funding was apparently earmarked to build these “bypass roads” and security enhancements for Israeli settlers in the occupied territories. Such direct subsidies for Israeli settlements placed the United States in violation of Article 7 of U.N. Security Council Resolution 465, which prohibits member states from assisting Israel in its colonization drive. So, not only has the United States allowed Israel to violate U.N. Security Council resolutions in continuing to maintain and expand its illegal settlements, Clinton placed the United States itself in violation of a U.N. Security Council mandate as well. It was frustration over the failure of the peace process to end Israel’s colonization drive that contributed to large numbers of Palestinians rejecting the diplomatic approach of Fatah and other moderate nationalists and embracing Hamas. Indeed, prior to this dramatic growth in settlements during the 1990s, Palestinian support for Hamas was less than 15 percent. Now it is close to a majority. Ironically, the Democrats’ criticism during the 2008 election campaign of the Bush administration’s handling of the Israeli-Palestinian conflict was that they were not engaged enough, in contrast to the Clinton administration, whose policies were widely praised. It is important, however, to remember that it was the former Democratic administration’s policies on Israeli settlements that have largely contributed to the dangerous impasse we see today. Recent calls by President Barack Obama for the government of Israel to freeze the expansion of Jewish settlements in the Israeli-occupied West Bank marks a sharp reversal from Democratic Party policy toward the Israeli colonization of Palestinian land. Indeed, for the past 20 years, Democrats in Washington have largely supported such Israeli expansionism in which Israeli occupation forces confiscate Palestinian land in territories seized in the June 1967 war to build Jewish-only communities that are increasingly interconnected through special highways from which Palestinians are largely banned. Whether the Obama administration will choose to use its enormous leverage to actually force the right-wing Israeli government to stop the expansion of such illegal settlements, however, remains to be seen. Much may depend on the reaction of the Democratic-controlled Congress. As outlined in my recent article, it was the Clinton administration and Democrats in Congress who were largely responsible for blocking efforts to freeze Israeli settlements in the early 1990s, when they were only half as large as they are now, and even subsidizing their expansion, policies that contributed directly to the collapse of the peace process in 2000 and the rise of Hamas. Similarly, during the Bush administration, Democrats in Congress continued their support for Israeli settlements policy. Obama’s challenge, then, is not only to fight off Republican opposition to his calls for a settlements freeze, which they refer to as “misguided,” but fellow Democrats as well. Though there are some indications that some leading Democrats who have supported Israeli settlements policy in the past may be moderating their views, there are others who appear willing to fight any effort by Obama to force Israel to change its expansionist policies. Four U.N. Security Council resolutions and a ruling by the International Court of Justice have formally recognized the illegality of Israel’s West Bank settlements, citing the Fourth Geneva Convention, which forbids any country from settling its civilians in territories seized by military force. Labeling the illegal colonization of someone else’s country as “a domestic policy” is nothing short of endorsement of the right of conquest. Virtually the entire international community recognizes the West Bank, including East Jerusalem, as being under belligerent occupation and that what constitutes Israel is the 78 percent of historic Palestine controlled by Israel prior to June 1967. The letter cites a number of areas where the senators insist the United States should pressure the Palestinians and other Arab parties to live up to their obligations in the peace process while saying nothing about a freeze on settlements or any other Israeli obligations. In an apparent effort to pressure the Obama administration to not enforce Israel’s international legal obligations regarding settlements, the letter also insists that such “details” should be negotiated only among the parties themselves, which — given the gross asymmetry in power between the Palestinians under occupation and their Israeli occupiers — appears to be a call for Obama to allow Israel to do what it will. In addition, House Democrats insist that “the parties themselves must negotiate the details of any agreement” and that the United States must “work closely with our democratic ally, who will be taking the greatest risks in any peace agreement,” which is essentially an insistence not to pressure Israel on the settlements issue. However, a number of members of Congress who have defended Israeli policies in that past, including Jewish Reps. Barney Frank, D-Mass., and Bob Filner, D-Calif., refused to sign the House letter. In addition, some Democrats, despite having signed the letter, informed Israeli Prime Minister Benjamin Netanyahu during his visit to Washington last month that they do not support his position on settlements, including such traditionally anti-Palestinian stalwarts as Senate Foreign Relations Committee Chairman Sen. John Kerry, D-Mass., House Foreign Relations Committee Chairman Rep. Howard Berman, D-Calif., and senior Democrats Sen. Carl Levin of Michigan and Rep. Henry Waxman of California. Similarly, when Netanyahu made his rounds on Capitol Hill after meeting with Obama, only House Minority Whip Rep. Eric Cantor, R-Va., openly defended him on the settlements issue. House Speaker Rep. Nancy Pelosi, D-Calif., and Senate Majority Leader Sen. Harry Reid, D-Nev., who have signed previous letters supporting the Israeli right, refused to sign onto the recent letters supporting the right-wing Netanyahu government’s position in the negotiations. Meanwhile, a congressional letter sponsored by Reps. Steve Cohen, D-Tenn., Charles Boustany, R-La., and Russ Carnahan, D-Mo., which declares that the Israeli settlements were among the things that “threaten the window of opportunity for the two-state solution” and that “American leadership is essential to achieving meaningful progress,” has received scores of signatures from their colleagues. Although a majority of congressional Democrats still apparently support the expansion of Israeli settlements, there have been an unprecedented number of defections from the once-solid support for the Israeli right. There could be a number of reasons for this apparent shift: One could simply be the desire to support a Democratic president early in his term on a tough foreign policy issue. Another could be that they could belatedly be recognizing, as does Obama, that anti-American extremism in the greater Middle East will continue to be stoked as long as there is no Israeli-Palestinian peace, that peace will not be possible without a viable Palestinian state and that such a state cannot exist as long as Israel continues to expand its settlements. A third reason could be that polls now indicate that a solid majority of Americans support the United States “getting tough” with Israel over the settlements, including over 70 percent of Democratic voters. If recent history is any indication, however, Obama may find that one of the biggest challenges in stopping Netanyahu’s settlements drive will be those in his own party on Capitol Hill. Yet when congressional Democrats have spoken about the report’s recommendations, they have consistently failed to mention the settlement freeze and talked only in terms of unilateral Palestinian initiatives. In response, the majority of House Democrats wrote President George W. Bush insisting that rather than a pushing for a de-escalation through reciprocal and simultaneous measures, U.S. policy should insist that ending Palestinian violence and the establishment of a new Palestinian leadership should be placed “above all” Israeli responsibilities, such as freezing the expansion of settlements. Pelosi and other Democratic leaders’ criticism of Bush’s call for a settlement freeze appeared to be based on their insistence that the Palestinians alone were responsible for implementing the first stage of the Road Map, essentially arguing that unless and until every act of violence against Israelis ends and the militias of Hamas other extremist groups are dismantled, Israel has no obligation to freeze the settlements. Throughout the peace process, congressional Democrats have ignored the fact that just as the Palestinians have an obligation to end terrorism regardless of whether Israel stops expanding its settlements, Israel is obliged to end the expansion of settlements regardless of whether the Palestinians end all terrorism. Nor have they seemed to recognize that it is the expansion of settlements that has markedly contributed to so many Palestinians giving up on a diplomatic route to a two-state solution and embracing Hamas and other radical groups instead. When prominent Democrats have dared raised concerns about Israel’s settlements policy, they have been roundly denounced by the party’s congressional leadership. This is particularly true when the criticism has centered on the way it has created an apartheidlike situation on the West Bank through the development of Jewish-only towns and Jewish-only highways accessible only to Palestinians with special passes to do certain menial labor. Even former President Jimmy Carter is not exempt. Pelosi and former Democratic National Committee Chairman Howard Dean denounced the Nobel Peace Prize winner’s opposition to these Israeli policies, insisting that “he does not speak for the Democratic Party.” Rather than address the legitimate concerns, leading Democrats — including a spokesperson for the Obama campaign — have falsely claimed that Carter’s position was that Israel was an apartheid state. Carter makes clear in his book, Palestine: Peace of Apartheid, that he is talking about the situation in the West Bank, not Israel itself. Carter correctly notes that despite some discrimination against Israel’s Arab minority, Israel is a democracy and does not practice apartheid within its internationally recognized borders and that he was only referring to the situation created by Israel’s illegal West Bank settlements. Yet, in order to distract Americans from taking seriously Carter’s concerns about Israel’s settlements policy, the Democratic Party leadership has chosen to not only distort his position but to even shun him, such as when they took the unprecedented step last year of denying a former president a podium at his party’s national convention. In July 2004, the International Court of Justice — with only the U.S. judge dissenting (largely on a technicality) — determined that Israel’s construction of the separation barrier outside Israeli internationally recognized borders (those prior to the June 1967 war) was illegal. The idea of a physical barrier between Israel and the new Palestinian state that would emerge from the occupied territories was originally promoted by Israeli moderates as a means of securing Israel from attack after the withdrawal of Israel’s occupation forces. 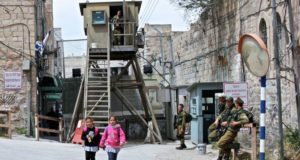 What the Israeli government has done, however, is to build most of the barrier, not along Israel’s recognized border as originally proposed, but in a lengthy, serpentine pattern through the occupied West Bank in order to incorporate illegal settlement blocs — along with large areas of Palestinian farmland — into Israel. Since the barrier was not following Israel’s borders, the court simply confirmed the widespread assumption in Israel and elsewhere that the wall was being built to incorporate illegal settlements into Israel, and therefore the wall itself was illegal. In other words, if one was simply concerned about Israel protecting itself from terrorist infiltration, there was no reason to object to the World Court’s ruling, since the only objection to the separation barrier involved the sections that went beyond Israel’s recognized borders. The only reason to oppose the ruling was if one supported the Israeli policy of building settlements in occupied territory and then erecting a wall so as to incorporate them into an illegally expanded Israel. In that clause, the resolution refers to the illegal settlements euphemistically as “Israeli population centers.” More significantly, the resolution refers to these settlements as being “in Israel,” in effect recognizing their annexation. With this kind of history, no wonder Netanyahu thinks he can get away with defying Obama’s admonition to stop expanding settlements and why he is so shocked that Obama has gone as far as he has. Obama himself appears to have already accepted Israeli annexation of settlements containing the majority of Israeli settlers that are in and around East Jerusalem, the only ones that have already been formally annexed into Israel. These settlements are just as illegal as those elsewhere on the West Bank, according the Fourth Geneva Convention. As problematic as Obama’s acquiescence to Israel’s illegal annexation may be, however, there are at least some scenarios for a final peace settlement in which Israel could hold onto most of the settlements in and around occupied East Jerusalem in return for an equivalent area currently recognized as being within Israel south of the Gaza Strip. By contrast, the settlements traditionally defended by congressional Democrats include not just these but settlement blocs that go far beyond even Israel’s greatly extended interpretation of what constitutes greater Jerusalem, which could realistically be exchanged in a land swap, dividing the West Bank into a series of noncontiguous cantons surrounded by Israel. Indeed, it appears that Democratic Party strategy all along has been identical to that of the Republicans: to prevent the establishment of a Palestinian state alongside Israel and to support the Israeli right in its expansionist agenda. In fact, Pelosi, Kerry, Berman, Hoyer and other Democratic leaders were on record explicitly opposing Palestinian statehood well into the 1990s, dropping their objections only after the Israeli government — then under the moderate Labor Party leadership — expressed its support for such a two-state solution. The question, then, is whether the Democrats will back their president in his call for a freeze on settlements or continue to ally with congressional Republicans in opposing any U.S. efforts to enforce Israel’s international obligations and make the necessary steps for peace by withdrawing from these illegal settlements. One of Congress’ strongest supporters of Israeli settlements is now secretary of state and appears to have changed her tune. As a senator, Rodham Clinton spoke at a pro-settlements rally in front of the United Nations and was the chief pro-settlements resolution promoter against the World Court in 2004. Whether the Obama administration will be willing to “press the point” in more than words and actually withhold aid and engage in other concrete measures to enforce this sentiment may depend on the willingness of the American public to back him up and make clear that reversal in the Democrats’ longstanding support for Israel’s settlements policy is long overdue.